The tyranny of Modi’s regime have brought untold miseries, deaths and uncertainties to the already languishing millions and millions of people in India. 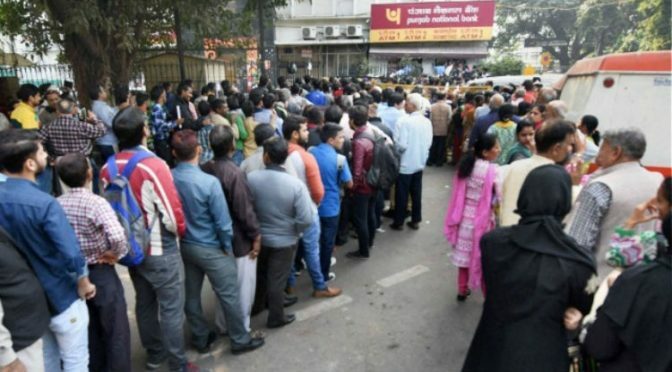 The ‘so called’ demonetisation of the 86% of the currency in use, has virtually brought the economy into a stand still, with more than 100 million people queuing up the banks and ATM’s everyday and more than 100 million working people particularly in the informal sectors losing their subsistence. This crude authoritarian gimmick of Modi has failed, it has failed the people and it failed hopelessly! This is the time for the leadership of the left parties and trade unions to come forward to launch an anti-establishment offensive. It is very important to bring out the most effective and important weapon from our arsenal – General Strike! 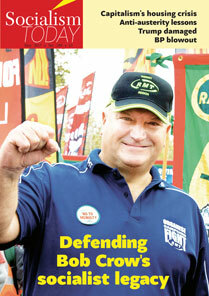 An all out general strike should be called by the working class organisations to root out this vicious government. At the same time it is the pro-corporate, neo-liberal Congress government and the likes of Manmohan Singh and P. Chidambaram who imposed Modi over the ordinary people! Sharing space with these opportunists and plunderers of different shades won’t make us any stronger. Society and its structures are so very complex to work on this notion of ‘an enemy of my enemy is my friend’! There is no point in forming an alliance on the basis of parliamentary opposition and it will be a futile exercise. Any serious effort to stall the pro big business, thoroughly reactionary, divisive and bizarre rule of this Modi led BJP should be on a class basis. We call for a united front platform of those forces genuinely representing the working class, peasants and all the oppressed layers with in it. The working class forces in this land mass called India is on its feet to unleash the challenge that will effectively land crushing blows to the anti-peoples’ politics of the Modi’s regime. A general strike action by the working class forces will also be the beginning of a sustained struggle to root out this establishment politics once and for all! – Modi must go! He and his government are responsible for the plight of this impoverished masses all around the country! – All those corporate companies should immediately pay of their debts with interest and if not, their assets should be taken, and the companies should be nationalised under workers control. No more loans to the corporates from public sector banks! – It is an important step ahead to take the banking and financial sectors from the hegemony of the capitalist system and bring them to workers control and public accountability. No to the bureaucrats, corrupt politicians and the corporate nexus! – A substantial wealth tax on the super rich and the government should immediately charter and settle the question of social contract that is long due to the Indian Citizens, like universal social security, health care etc. Also need to be addressed the question of the minimum living wage and we propose that it should be Rs.100 per hour. – Following the present circumstances and experiences it is important to understand the need for a democratic socialist society where all the big industries and the important sectors should be nationalised under workers control, for a society that will work for every one! Let us all fight for it! Modi has failed the people, he must Go! MSWU Release: Onwards to the Dharna and Hunger Strike of 7th and 8th November ! !